So I pick up again where I left a while ago, on ‘I see, I see – what do I see?’ and bring attention to another exhibition that I visited recently at the Gladstone Gallery in Manhattan. This exhibition by Anish Kapoor somehow connects with some of the notions approached in the Olafur Eliasson exhibition. Both work with reflective surfaces that mirror the viewer and solicit a certain interaction between the pieces and the viewer. Both seem to propose dispositions for experiencing optical phenomena. 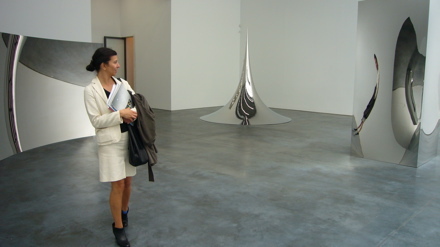 The exhibition consists of a space where several monumental and shiny sculptures are installed. When inspecting each of the four pieces closer I could identify my own reflection, deformed like the effects of amusement park mirrors –where proportions of the body are distorted by the concave and convex shapes. The press release the says “The dynamic interplay between the work of art and its surroundings make the viewer a vital catalyst initiating the latent sensual capabilities of sculpture.” Perhaps, like Eliasson, Kapoor is preoccupied by ‘relationships between reality, perception and representation’, and perhaps he is attempting to broach the ‘sublime’ – yet I left this exhibition feeling more alienated than connected to my surroundings. We went to see Olafur Eliasson’s exhibition at the Moma. Having heard mixed reviews, I was curious to see and experience his exhibition “Take you time” remembering how I enjoyed experiencing the Weather project at the Tate Modern in 2003/04. This major exhibition offered a sequence of installations, mainly consisting of light projections and reflective surfaces to focus our seeing, and on how we see. Capturing visual perception. Starting off in a strong yellow light, that hurts the eyes and turns everything monochrome, we entered a closet sized space with mirrors reflecting both the outside surroundings and ourselves infinitely. And so the exhibition continued, each room offering a new environment to experience ways of seeing… Our fellow viewers seemed content with the experiences they were getting flirting with the boundaries of entertainment. The cameras kept clicking away – my own finger trigger-happy, as I too wanted to capture glimpses of what I was seeing. I like being offered kaleidoscopes that propose multi-facetted visions of inside-outside, reversing up and down including my own reflection in the mirror images. It oddly situates you in a space and time and somehow, to me, manifests some of that complex equation. Art /Design. This exhibition is designed to invite the spectator into spaces where they become participants. As such, they are ‘user friendly’ spaces (if we use the design lingo). I suppose this is an example of ‘experience design’. Yet it is ‘art’ due to the museum context. The presentations are sharp, shiny – nearly clinical and the artist’s voice is clearly not in the work as you see them – but in the propositions. On one level it felt generous, if you accept the work as dispositions* and interact with them. Even on a sensual level did I almost manage to transcend my awareness of being in a museum, which so blatantly affects our perception of these spaces. Yes, today is the official world environment day – the 5th of June. So what can we do to celebrate? A friend just watched a guy climb the New York Times building! Just to imagine it is daunting for most of us! But Alain Robert is not only a climber but also an activist with a mission to create awareness for global warming (or warning as I tend to mistype it). Perhaps this might just be the day for all of us to choose one action that we vow to do that will contribute in a positive way to helping the world environment. Perhaps you can even make a ritual out of it? I was thinking a while ago, inspired by the Jewish tradition of Shabbat – that it would be interesting to regularly have one dedicated evening, with minimum electricity. This could be a moment shared with friends and family, where after preparing dinner, you switch off as many electrical devices as possible (lights, TV, computer, stereo …) and light the candles. Share stories, play games, spend time together, or perhaps get up to scratch on reading (this might require a gas-lamp). It would be a way of lending the sense of appreciation for what we have and take for granted. It might be a way of bringing awareness to habits by changing them, and simply slowing down our pace by focusing on the present. It does require commitment and discipline, yet offers a space for other things to emerge. And the affordance would be reducing energy consumption for a few hours… What do you think? What should such an evening be called?